Fibromyalgia is, a pain-in-the-everywhere … and if you have it, you truly know what I mean. Little did I know at the time of the accident, that I also got fibromyalgia. I never recovered fully, and yet here I am almost 18 years later, trying to find a way to give back, to share what I have learned. Prior to that accident, I was a healthy athlete, a runner, and active in everything from sports to daily workouts, to music and performing as a singer. Recently I decided to write this multi-part post on fibromyalgia since I have been living with it now for 17+ years. Maybe something I write may help someone else along the way. As far as I know, at this time, there is no known one cause and no one cure at this time for fibromyalgia. There are many theories, which you can research and look up online. I have yet to find a definitive cure. I have my opinions as to which theory makes the most sense as far as the cause, which is neurological, as my fibromyalgia came on after neck and back injuries and a concussion, post car accident; post-traumatic. But who knows? Nobody. Fibromyalgia is a medical mystery. So what CAN you and I do in the meantime? My first tip? 1. Keep Moving. Keep Your Body Moving. When you have fibromyalgia, all movement can be painful. Does that mean we get to stop moving? No. In my opinion, that’s the worst thing to do; to stop moving. YES, we must rest and need to rest. There seems to be no way around that. However, EVEN when the pain of fibromyalgia hurts, I keep on moving, and at minimum, I walk. Walking is free, and I can make it as short or long a trip as I can tolerate each day. (which varies day to day) Plus, even if in pain, my (and yours) heart and lungs need the exercise, and my mind needs the mental stimulation of being outdoors, and the social and spiritual aspects of doing exercise, well, you get the gist; crucial. Please keep coming back to this blog, as I will post once per week for a few weeks on this topic of fibromyalgia and what I currently use and things that I have done in past, to try to come to peace with it, and also to gain some comfort from the relentless, ever-changing 24/7 pain … in the everywhere. Keep on trying anything and everything. As many of you who have it know, fibromyalgia pain changes from day to day, and often, from moment to moment. The toughest part of the syndrome to deal with is that you wake up and never know what you are going to get each day. It is totally unpredictable, mentally, emotionally and physically. That lack of predictability is hard on the sufferer and very confusing to those who love and work with them. 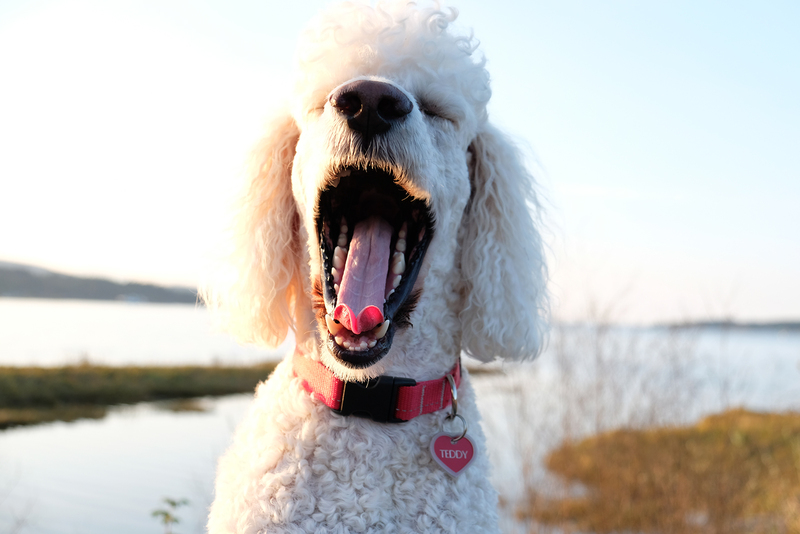 That’s it for now, and I leave you with a little humour, hopefully a smile, with a photo of my standard poodle Teddy. He (also known as Dr. T.) makes me smile every single day, and he is one of the ways that I cope, and take my mind off of the pain.